BESYL Carabiner Keychain Stainless Steel Multi-tool, Compact & Lightweight Edc Survival Tactical Gear with Hex Wrench, Bottle Opener & Carabiner by BESYL at Kerinci. MPN: BESYLKeyChain032. Hurry! Limited time offer. Offer valid only while supplies last. Length: 2.68in (68mm); Width: 1.02in (26mm); Thickness: 0.12in (3mm);Weight: 1.09oz (31g). This multitool packs 10 tools into a credit card-sized carabiner multi-tool including a flat head style screwdriver, 6 wrenches, a bottle opener, a can opener, a hex bit driver and keyloop. Featuring high strength, low weight ratio and excellent corrosion resistance. It will fit easily on your keychain or in your pocket, purse and bag. 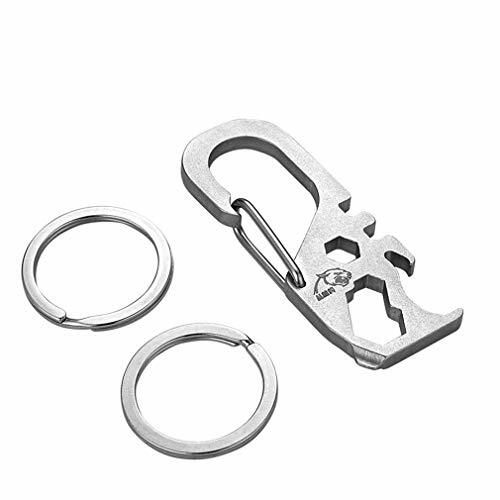 Stainless Steel Multi-tool Carabiner. Best Unique Tool Gift for DIY Handyman, Father/Dad, Husband, Boyfriend, Men and Women. If you have any questions about this product by BESYL, contact us by completing and submitting the form below. If you are looking for a specif part number, please include it with your message.